Most representations of Mother India are similar to Ravi Varma’s paintings of goddesses, a woman in a sari juxtaposed against a map of India and often with symbols of Shakti like the tiger or trident. In early artwork she is often present along with national leaders. [X] [X]. There are exceptions, most notably Abanindranath’s early painting of the country as a goddess. There are a few other exceptions to this in the early 20th century. 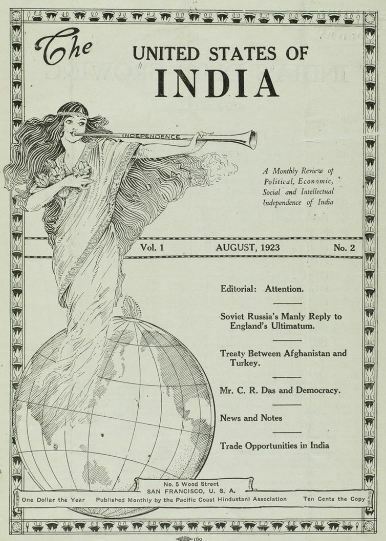 Decidedly the jauntiest of “Bharat Matas” is the one on the cover of the publications of the Gadar Party, [X] [X]. Arguably the figure is not a goddess given the founder of the party was an atheist, nevertheless the illustration does evoke representations of the era where a woman embodied the spirit of an independent country. The party was based in the US which perhaps also accounts for the illustration, which is part goddess, part modern Indian woman. As to fashion notes, note the headband which came into vogue around the 1910s. This entry was posted in 1910s, 1920s, Art, British Raj, Colonial, Early 20th Century, Flapper, Goddess, History, Illustration, Independence, India, Indian History, Sari, Sari Blouse, vintage art, Women and tagged 1910s, 1923, Bharat Mata, flapper, Gadar Party, goddess, india, Indian independence, Mother India, Shakti, United States. Bookmark the permalink. I love the jauntiness and style! I like this representation a lot I must say…..